Potatoes, some of the tastiest members of the nightshade family, were domesticated from wild potatoes around 10,000 years ago. Sure, they were originally cultivated in South America, but they’re now popular all over the world. Check out our guide to growing potatoes to determine which are best for you and your family. These spectacular spuds originated in the Andean highlands: namely modern-day Peru and Bolivia. Would you believe that there are over 4,000 native varieties still grown there today? Potatoes didn’t reach Europe until the 16th century, when Sir Walter Raleigh brought potatoes back to the U.K. They soon secured a top spot amongst many countries’ staple foods. Today, it’s difficult to imagine Norwegian or German cuisine without boiled potatoes, or Italy without gnocchi, not to mention the British Isles’ famous shepherd’s pie. In recent years, the available varieties of seed potatoes have grown exponentially. Gardeners now have easy access to all sorts of interesting types, including heirlooms that are becoming popular again. There are also new, modern-yet-simple growing techniquesthat take limited growing space into account. As such, you don’t need to be like me 8 years ago when we started our homestead by digging 75 feet worth of potato trenches by hand. So, how do you decide what varieties to grow, or how to grow them? In this guide, you’ll learn everything you need to know about growing potatoes. Dig in! As mentioned, there is a plethora of potato varieties to choose from. Seed catalogs’ potato sections are so full of interesting choices that it’s easy to get carried away. I’ve grown potatoes for almost 10 years, and have tried probably over 30 different varieties. Here are the basic potato categories, the best uses for them, and some of my favorite types in each category to help get you started. If you want a consistent supply of potatoes, it’s a good idea to choose two different varieties. Pick an early type that’ll be ready by early summer, and a main crop choice that’ll be ready to eat in late summer/early fall. Early season potatoes reach maturity within 75 to 90 days. Some of the most well-known varieties in this category are Yukon Gold or Norland. Mid-Season potatoes mature in 95-110 days. Some of my favorite potatoes ever are in this category: Purple Viking, French Fingerling, and Rose Finn Apple. Late Season, or “main crop” potatoes mature in 120-135 days. Try Carola or Purple Peruvian. If you want to overwinter your potato harvest, some of the best potatoes for storage are Elba, Rose Finn Apple, Yukon Gold, or Russian Banana Fingerling. These last 6-8 months in cold storage. Perhaps it is more important for you to choose potato varieties based on what you can do with them. Here are the basic culinary categories, and what dishes they’re best used for. Sometimes called “white potatoes” (but include other colors as well, as you will see) they have an equal balance of starch and waxy texture This makes them the “go-to” potato if you aren’t sure which potato to use. They’re also the best choice for making homemade gnocchi. Try Elba or Yukon Gold. Purple and blue potatoes also fall in the “all-purpose” category, and have an earthy, nutty flavor. They also have the lowest sugar content. They’re characterized by blue or purple skin, and blue, purple lavender, pink, red, or white flesh. Try Purple Peruvian or Purple Viking varieties. Waxy potatoes have the least amount of starch, so they hold their shape when cooked. They also have the classic potato flavor. Best for soups, stews and potato salads, they’re also the right choice for scalloped potatoes and grilling. A lot of the yellow and red-skinned potato varieties fall into this category. Try Rose Gold or Carola. Fingerlings are part of the “waxy” category and adored for their buttery flesh and nutty flavor. Skin colors range from red, orange, and purple to white varieties, and their flesh can be red and purple to yellow and white. Sometimes the flesh color has a marbled look. They’re are best prepared roasted, or boiled whole. Try Russian Banana or French Fingerling. Also known as Idaho potatoes… when they’re grown in Idaho. I’ve never been a big fan of them, mainly because I don’t love baked potatoes, and generally favor all-purpose varieties when I want to make other dishes that russets are good for. Russets are the highest in starch and best used when baking, mashing, pureeing, and frying. Think hash browns, creamy potato soup, French fries, and baked potatoes. I’ve grown potatoes using several different methods, and there are about as many methods as potato varieties. As mentioned earlier, I used the classic trench and hilling method. I’ve also grown them in straw and used raised beds. While the trench method was the most cost-effective (the biggest resource used was manpower), the straw (or “no-dig”), and raised bed methods produced greater yields. Potatoes can be grown in many different ways, and becoming more popular every year is to grow them in bags of various kinds. The best varieties for containers are All Blue, Yukon Gold, and Fingerling varieties. Potatoes can be grown nearly everywhere and in most gardening zones. If you live in zone 8 or higher, you may have an easier time growing potatoes in buckets, and even indoors, since you can control the conditions more easily. Potatoes prefer cool soil, and tuber growth can stunt when soil temperatures reach 75 degrees Fahrenheit (24 C.). At 85 F. (30 C.), they stop growing altogether. Seed potatoes—or potatoes with eyes—should be planted directly into the ground. Some people like to cut their seed potatoes in order to create more, while others keep them whole, especially if the tubers are small. We like to cut our seed potatoes, making sure that each piece contains at least one growing eye. If you cut your potatoes, you must allow them to cure, or dry for a few days before planting. Drying creates a thin crust over the cut edges, which prevents them from rotting underground. Make sure to spread them out in a single layer to dry. You know they’re ready to plant with the cut edges feel smooth and slightly leathery, with no signs of moisture seeping out. All potato plant varieties may be planted as soon as the ground can be worked in the early spring. Just keep soil temperatures and final frost dates in mind. When we lived in northern Vermont, we planted our potatoes after Memorial Day. Mid- and late-season potatoes can also be planted as late as the first of July. Plant seed potatoes with the cut side down, in rows that are 3 inches deep and 10 inches apart. Subsequent rows should be spaced 2 feet apart. Potato plants will begin to grow when the soil temperature has reached 45 degrees F. You’ll begin to see sprouts in 2 to 4 weeks’ time. If you’re using conventional growing methods, build up the soil level around the stems once they begin to grow. Then bury the stems’ lower portions with mulch, soil, or straw depending on the growing method. Potatoes do best when planted in light, loose, well-drained soil, in a spot that receives at least six hours of sunlight a day. They need moisture, but don’t like to be waterlogged. The latter can happen if you live in an area with heavy rainfall. It is, however, important to keep them well-watered when the plants are flowering, and immediately following the flowering stage. Luckily, potatoes are also very adaptable and will almost always produce a decent crop, even when the soil and growing conditions are less than perfect. The most common problems when growing potatoes have to do with temperature, and soil that’s too damp. 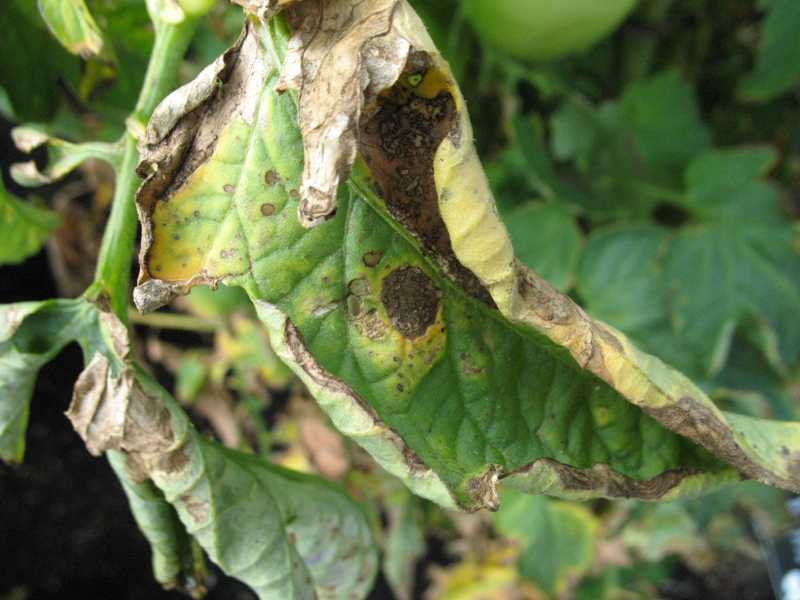 One of the main problems is blight: a fungus that creates brown lesions on the leaves. It can cause foliage to collapse and the tubers to rot. It can also affect tomatoes. This disease happens most often in areas that receive significant rainfall, like the eastern United States, and was the cause of the Irish potato famine. Elba, German Butterball, and Burbank Russet are good varieties to grow if you live in a blight-prone area. Since our homestead in northern Vermont was in a very blight-prone and fungus producing area, we chose resistant varieties and also sprinkled our seed potatoes with a little agricultural sulfur powder, and never had significant problems. If you notice blight affecting your plants’ leaves, remove all affected foliage to prevent the disease from getting into the tubers. Scab is another disease that affects potato crops. It causes brown scarring on the tubers’ surface and may reduce yields. This is mostly of concern to commercial growers, but does make peeling potatoes more of a pain than it normally is. Scab isn’t usually an issue if you practice crop rotation, and your soils are balanced and rich. The best varieties to resist scab are Purple Viking, Rose Finn Apple, Russian Banana, and Elba. It’s really important to rotate crops. By growing them in a different location and not planting in the original bed until at least 3 years has passed, you help avoid the buildup of soil-borne diseases. Potatoes are tubers with deep roots, so the best companions are ones that grow aboveground and don’t interfere with potatoes’ root systems. Also, potatoes are harvested late in the season, so planting early-season vegetables around them is a good idea. Lettuce, spinach, scallions, and radishes are shallow-rooted veggies that are a good choice for occupying the spaces between potato plants. Chamomile, basil, yarrow, parsley, beans, cabbage, and corn are said to improve the tubers’ flavor when grown close to them. If you want to eat “new” potatoes (and every gardener should try this delicacy) you can harvest the largest ones 2-3 weeks after the plants have finished flowering. Leave the smaller ones in the ground to let them grow bigger. New potatoes should be eaten the same day as you harvest them. For the main crop, harvest 2-3 weeks after the foliage begins to yellow and die back in late summer or early fall. I usually wait until the leaves have browned before I harvest my potatoes, making sure all growth has finished. If you’ve used the trench method, use a garden fork, and gently dig around the plant stem. Once I’ve loosened the soil, I use my hands to dig out the potatoes. If you’ve used the “no-dig” or straw mulch method, just remove the straw with your hands, and pull the potatoes as you find them. For bag methods, just dump them out. Once they’re out of the ground, let the potatoes rest to cure, unwashed for 2-3 days after harvest. You can leave them outside if the weather is warm and sunny, or let them dry in a shed or garage if it’s wet. This step allows the skins to harden, which is essential for good storage results.